Labor is at the heart of the food system—economically, politically, and ethically. This JAFSCD issue brings concerns about labor economics, politics, and ethics to contemporary food systems praxis. In so doing, we build upon the work of Cesar Chavez, Carey McWilliams, Deborah Fink, Dolores Huerta, Don Villarejo, Frank Bardacke, John Steinbeck, William Friedland, and countless others. Their activism and scholarship, set in an earlier context, has not always translated into the promise of the new sustainable or alternative agrifood movement, which, as Biewener states, has often focused more on "good food" than "good jobs." 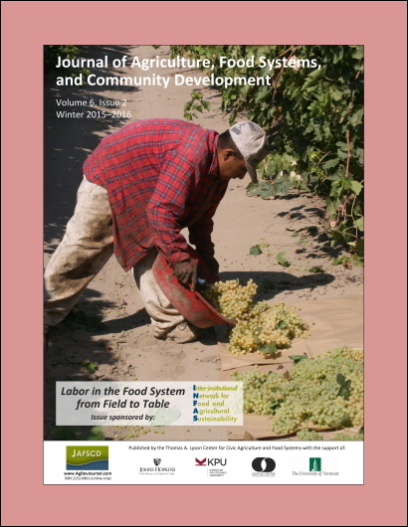 As someone who has worked as a farm laborer, food factory worker, and food service worker and written about social justice, racism, labor, gender, and localism in sustainable and alternative food systems for more than 25 years, I am honored to introduce the work of scholar-activists in this journal issue. Chair, Department of Food Systems and Society, Marylhurst University, Portland, Oregon USA. Patricia Allen directs a low-residency Master of Science program in Food Systems and Society that concentrates on social justice and social change in the food system (http://www.marylhurst.edu/food). Her work on race, class, and gender; discourse; localism; and social movements has been published in numerous journal articles, Food for the Future: Conditions of Contradictions of Sustainability (1993), and Together at the Table: Sustainability and Sustenance in the American Agrifood System (2004). She is a past chair of the Inter-Institutional Network for Food and Agricultural Sustainability (INFAS) executive committee.